Flashback! Action in the Diamond vs Herstelling match on day one of the competition, May 18, 2014. 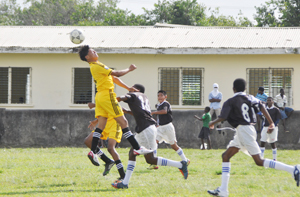 Under-17 league are fixed for today at the Grove Playfield from 14:00hrs. Coming off a draw in their first game with Diamond United, Herstelling will be a confident bunch when they match skills with Timehri Panthers who lost their opening game by the slimmest of margins, 1-0 against Agricola. Teams will be conscious that accumulating points would be critical to their chances of making the final four. The day’s feature game will be a ding dong clash between Agricola and Diamond from 16:00hrs. Diamond will start as favourites being the more experienced team but Agricola will be aiming to continue their winning ways. Fans can look forward to an entertaining afternoon of football.